Please allow me to tell you a story about a very nice Chinese police officer, who kicked the living crap out of a shed load of naughty mafia types with dodgy dubbing. Huh? What do you mean you've heard this story already? Oh! Fair enough. Then you won’t want to watch this 93 minute movie made in 1983! It was Directed by Jackie Chan; and Starred the man himself, with Brigitte Lin, Maggie Cheung, and Marz. I honestly thought everything was going to be hunky dory once I managed to get my hands on that unscrupulous crime lord, Chu Tao (Yuen Chor). 'Inspector Jackie Chan (guess who?)' I said to myself, 'Now this pug faced gimp is finally behind bars, at last I can put my feet up and have a nice holiday with my adorable girlfriend, May (Maggie Cheung). But no. I forgot about one crucial factor, didn't I? I forgot that Chu's secretary, Selina Fong (Brigitte Lin), had to testify against her boss before this endeavor truly ended. So go on. Guess who was assigned to protect this stuck up cow? No. Not any of my fellow police officers. It was me of course. Worst still, because of Selina's reluctancy to play along, I try and trick her to into becoming more compliant by getting one of my work colleagues -- (Marz) -- to break into her apartment and then pretends to be a knife wielding maniac who wants to kill her (don't think she'll be able to play freebingo tonight). Strangely enough, my ploy seems to work out alright. And eventually Selina is willing to coming back to my apartment with me, despite being attacked by Chu's men along the way. Hey. Don't worry, folks. I don't have any problems defending myself from these fiends. Even though I do have some problems defending myself from May when she spots me with Selina afterwards. But then again, that's most probably why what next transpires all kicks off when a witness statements isn't recorded properly. As a bad-guy eventually has his day in court - a good guy is finally cut short - a hostage situation turns very nasty - and at the end of the day, Chu better save up for some extreme rhinoplasty. 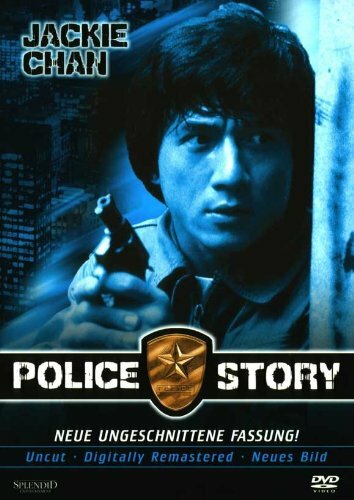 In the past, Jackie Chan has publicly stated that 'Police Story' was one of his all time favorite films. And do you know what? Is it probably one of mine too. Sort of. 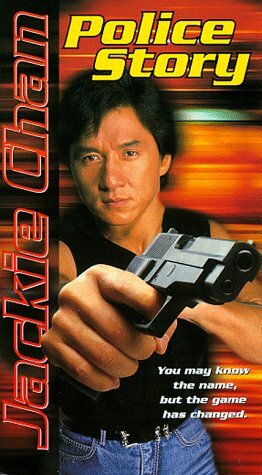 Because it sure is up there with all of the other classic Jackie Chan films of this era. The story is simple. The action is dynamic. The dubbing is... errr... interesting. The music is moving. Plus the overall presentation has now been cast in stone, allowing a shed load of other films to copy its format. Now is this a good thing or a bad thing? Well, I don’t rightly know. All I can say is that this movie is a product of its time -- and its a very good product too. Jackie, as always, tries to give 110% to whatever he’s doing, be it fighting – kicking – jumping – clowning – or acting, because you know what your going to get with Jackie, and this is something which is still apparent, even today. Granted, this film does tonally feel like it was written by my 13 year old nephew, but still, it has a heart and a message as well -- one about honorable men doing honorable things. Or in Jackie’s case, driving through a shanty town in a red Mitsubishi, and later jumping down a long lit poll over 100 feet in height. Now this is what I mean by Jackie giving 110%. Cause who else do you know in movies who would do something like that? Willis? Stallone? Depp? Barney? Don’t make me laugh. Jackie’s the only action star with enough gumption, and enough loose marbles, to beat himself black and blue to make a film for that little bit extra 'action-wise'. Don’t believe me! Just look at the outtakes at the end of the film – a classic Hong Kong film – which tell a good story... a good police story.